Tottenham Hotspur play their home matches at the Wembley Stadium, London. Tottenham have a large fan base and most home and away games are sell-out fast. The biggest matches of the season are against Arsenal, Chelsea F.C and Manchester United. This guide aims to show you how and websites to order Tottenham tickets. If you want to purchase tickets for more than one game this season then you get the One Hotspur membership. The main benefit of being a One Hotspur Member is that members can purchase ONE additional guest ticket for any home league fixture. The One Hotspur membership has different levels with the Lily-white being most popular. The cost is £48 per membership. With the fantastic history, small stadium and large amount of fans tickets are always in high demand. The best way to get cheap Spurs tickets is to book directly through the club when possible. However most Premier League and Champions League games involving Tottenham sell out due to high demand. However there are some games throughout the season that are cheaper than others. These are normally matches that take place mid-week and are against lower teams in the league. Try to book your tickets directly through TottenhamHotspur.com, failing that we recommend the companies below whom offer the best prices. There are often tickets left available at the official box office located at the stadium. However, if you want to buy more than one ticket then purchase them via another website listed below. Fans have complained that they have only been able to purchase single seats on match days. Our advice would be to call the office in the days leading up to the game to check for tickets. Tottenham Hotspur use the ticket exchange platform StubHub to manage the buying and selling of tickets between Spurs fans online. The website is good for single tickets to Category C fixtures. To purchase tickets then it is a requirement to have One Tottenham membership account. Located in the Tottenham area of London with the local tube station being Seven Sisters. Local ticket sellers can always be found outside the stadium and major transport links. The major issue with purchasing tickets outside the stadium is that there is no guarantee tickets are authentic. The main rivals of Spurs are Arsenal, Chelsea and West Ham. Tottenham Hotspur tickets are either membership, season cards or actual paper tickets. The method to enter is the same for all holders, simply walk to the turnstile and scan your ticket. It is important to go to the correct stand of the ticket. Whilst FA Cup tickets for Tottenham are not expensive, they do become so as the tournament progresses. If Tottenham Hotspur reach the final, tickets will be expensive. Get your Tottenham Hotspur tickets by using a SafeFootballTickets.com recommended company. We recommend Spurs fans to order the match tickets at least 14 days before the game, prices will rise. The Tottenham Hotspur Stadium is not located in an area with many hotels and activities for tourists, in fact the area is one of the most deprived areas of London. The best location for the hotels is North London for easy access to the stadium. We personally recommend Paddington as great place to stay with hotels for all budget ranges. It is advised to arrive at the stadium around 2 hours before kick-off to enjoy the pre-match buildup, as well as the atmosphere of the game. Wembley Stadium is located in the district of Brent and is accessible by many different transport links. Wembley Stadium is the home of the national football team of England and is one of the biggest in world football. The capacity of the stadium is 80,000 which means that there has been an increase in Tottenham Hotspur tickets. With this fans have more of a chance to purchase tickets for the home matches than ever before. The big games versus Arsenal, Liverpool and Manchester United in high demand. The chance for fans to see these matches in a new stadium has increased the fans that want to attend the game. Depending on the opponents will determine the price of the tickets in the secondary market. Whilst official tickets will cost between £40 and £200 the resale price will be higher. For Tottenham Hotspur tickets in the champions league order your LilyWhite membership. 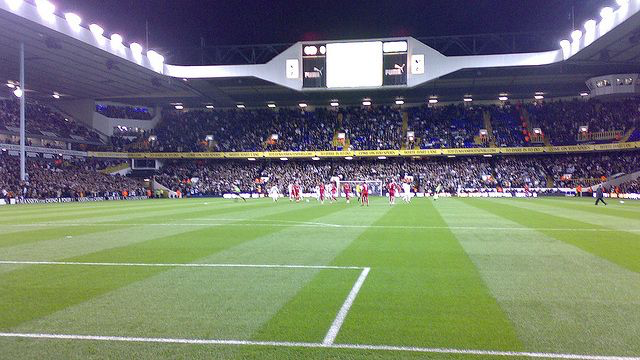 There are several Twitter accounts which offer to buy and sell tickets for Tottenham Hotspur. However there is no real way of confirming the tickets that you purchase. The advice given by SafeFootballTickets.com is to ensure you can verify the tickets for purchase. Order your tickets from trusted sources to ensure you get in the stadium for the match. Beware of cheap tickets at low prices. Wembley Stadium doesn’t sell tickets on game days. We advise people to try and get the tickets close to the stadium and ensure entry into the game. Would like to watch the match between Tottenham hotspurs and swansea on 3 Dec （@London）. Can you let me know how to buy ticket in London ?